Today I want to write a quick Pulp Alley review. I am a big fan of movies like Indiana Jones, the Mummy and stuff like that. Therefore, Pulp is one of my favorite settings in our hobby. So it was obvious, that I had to give Pulp Alley a try. First of all Pulp Alley is a skirmish game. You only need 4-6 miniatures to form a league. So with a dozen of miniatures, you are good to go. This makes it super easy to start. But first things first. Pulp Alley is not for tournament play. So if you are looking for a highly competitive game, I guess Pulp Alley is probably not for you. It is more of a story driven game. So if the players are okay with that and lean into the story, you will get the most out of it. Pulp Alley uses some pretty clever gaming mechanics. First of all, the dice mechanic is pretty simple. You need to roll 4+, which counts as a success. The skill level of the characters will determine the type of dice you will need to roll. For example, a leader will mostly use d10, a follower d6. Injuries and stuff like that will lower your dice level. I really like this mechanic, because it is simple but effective. You don’t have to search tables and stuff like that, to determine the result of your actions. So the game is pretty fast and the action is on the table, and not in the rulebook. There are two ways using the fortune cards. First, when the card is played by an opposing player, you simply use the top half of the card. Now fortune comes into play. An unexpected event happens, which has consequences for your character. Fortune is split into two sections: play (when to play the card) and effect. On the other hand, from time to time your characters face challenges. Mostly this happens, when your character encounters perils or plot points. Now you use the bottom half of the card. 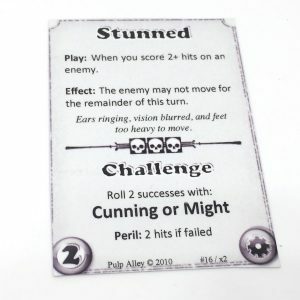 In this example, you need to roll at least 2 successes using your cunning or might skill. If you fail, your character has to suffer the consequences. In this case: 2 hits. There are not only fortune cards. For completing plot points you receive reward cards, which gives your leagues some nice bonuses. 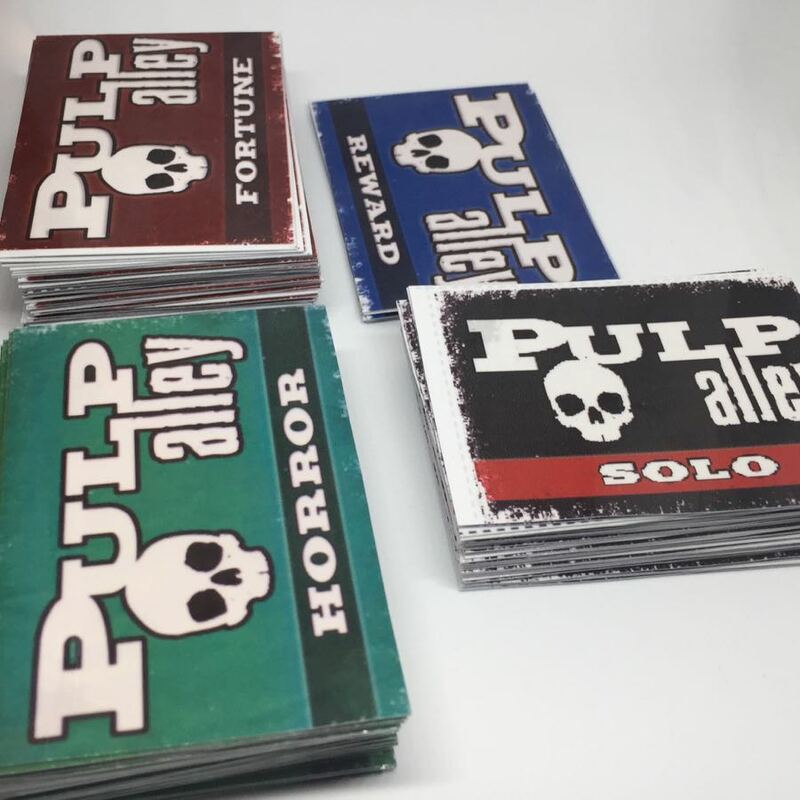 If you don’t have a gaming buddy, you can still play Pulp Alley using the solo deck. And for special settings, there is a horror deck as well. 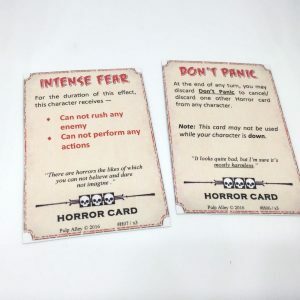 The horror deck offers some nice additions and adds, even more, fun to the game. You can buy the printed cards or you can buy a .pdf and print them by yourself. The pricing is really fair, so I suggest to get the additional card decks for extra fun. 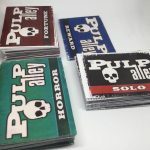 Should I give Pulp Alley a try? Absolutely. Pulp Alley is a fantastic game. I really like the simple mechanics of the game. Besides that, you can use the rules with every possible setting. So you are not restricted to pulp gaming – fantasy or sci-fi, just to name two, will work just fine. So if you are interested, why do not give it a try? You can download the quick start rules and the fortune deck for free! I hope my Pulp Alley review gives you a quick glance on the tremendous possibilities of this rule set. If you already play the game, maybe you are interested in my upcoming fantasy campaign in the world of Eskana. What are your ideas for leagues? Share it in the comments! I first learned about Pulp Alley because of a link on Pulpfigures.com. Bob Murch’s sculpts were so inspiring I wanted some game to play with them–and Pulp Alley was it. Choosing a first league based on the Pulp Figures is easy–gangster, Nazi, cultist, explorer, newspaper guy–lots of choices. Bob Murch’s stuff is awesome. Your story sounds pretty familiar to me. Thanks for your comment. I’m working on a touring Cricket team from the interwar period. They travel the empire staging exhibition matches. The catch is that they are undercover agents, acting to thwart enemies of the King. It’s amazing how much gear you can squeeze into an innocent looking cricket bag. The biggest struggle I’m finding is blending the various tones of white, cream, bone and ivory as I paint them. Thanks for your comment, Stephen. The Cricket team sounds amazing. Great idea!